It’s no secret that I crochet, at least I don’t think it’s a secret as I’ve mentioned it a few times. I have crocheted for upwards of six or seven hours sometimes, going until my hands or eyes, or both, give up and call, “Uncle”. I’m sure that the day I require bifocals will be interesting – at least I recall my Mom’s trials and tribulations with her’s when she first got them. Anyway, I’ve another nephew that was due in April but is adamant about making his appearance sooner than that (any day now) and while his mother is not on speaking terms with me, I will be damned if that baby doesn’t have a blanket to call his own, because I’ll be his Aunt, and that’s what Aunt’s do. So I made one. Photos of that blanket will be posted another day. HA! Bet you thought these were the squares I was using for that, didn’t you. Nope, I just happened to find myself with a glut (a new favorite word) of “baby” yarn and having just recently made a purchase at the fabric store of a book of 99 varieties of “Granny Squares”, I decided to tackle another square style, this is #57. The picture is from my cell phone and the color isn’t great, but from inside to outside the colors are: yellow, white, pink and green. I will have 13 of those. Then I need to figure out how to make the others to give me enough for another blanket. I’ll be ready for the next baby to arrive. Do you crochet or knit? Do you have another hobby that you employ to make gifts for new arrivals? 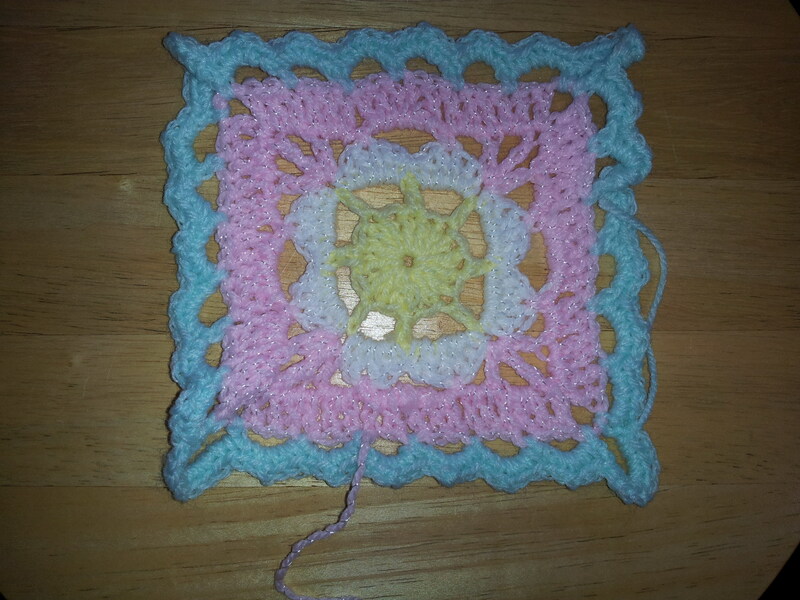 This entry was posted in crafting, Musings, Personal, Random Thoughts and tagged baby blanket, crochet, crocheting, granny square, Granny Squares. Bookmark the permalink. I can make a very large knot. But only if I’m not trying to.